An old friend who was looking to get rid of some punk art books asked to do a trade for an original piece a while ago. He finally opted for a small painting for his partner's daughter, something light that could be shipped overseas where she lives. When he asked what her favorite animal was she said "dogs" which is pretty broad. 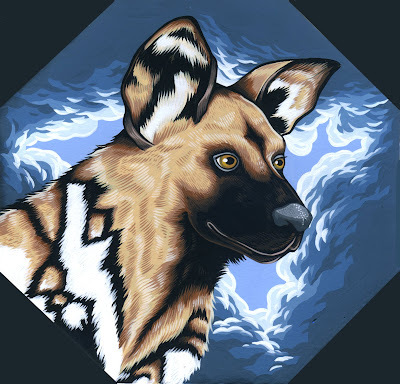 I opted to paint a Lycaon pictus (aka. Painted dog, Painted wolf, Ornate wolf, African wild dog, African hunting dog) because I've wanted to paint one for a while now (I think they're absolutely beautiful) and because as a wild dog they seemed to fit the bill. Painted dogs are endangered and conservation efforts suffer from prejudice against and fear of predatory animals. 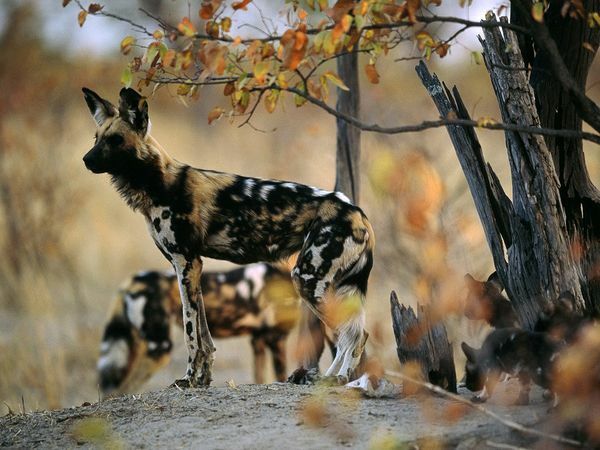 They also lose their food source to larger predators as their habitat shrinks (they compete with lions and hyenas) and their already waning numbers are susceptible to viral outbreaks that can wipe out whole populations. Speaking of, I will most likely be participating in yet another art show to benefit animals (I could do these forever) and I've been doing some research on endangered snakes. That might be the next project!